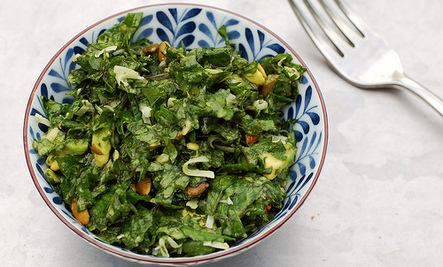 This salad has so many wonderful things going for it – it’s a trifecta of superfoods. 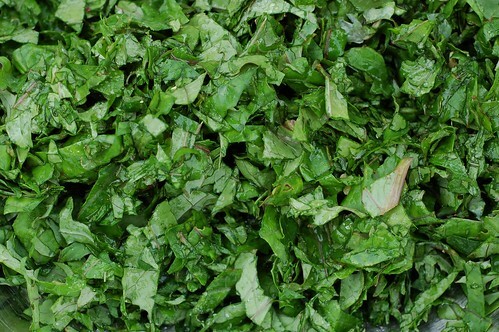 There’s the kale – so fresh and packed full of vitamins (C,A, and K, especially) and nutrients. I actually think that you can taste the goodness – for me, much of kale’s appeal lies in its distinctive, mineral-like flavor. Then there’s the avocado – buttery, smooth, slightly nutty and full of good stuff including nearly 20 vitamins, minerals and phytonutrients. And the coconut oil! It has antiviral, antibacterial and antifungal properties, and it helps to lower cholesterol, aid digestion and increase thyroid function and insulin use. After decades of economically-motivated misinformation spread by the soy and corn industries, we now know that coconut oil is one of the healthiest fats we can eat. The lemon juice and the garlic are pretty darn good for you, too. But, more importantly, it tastes really good. Assembly is pretty easy. 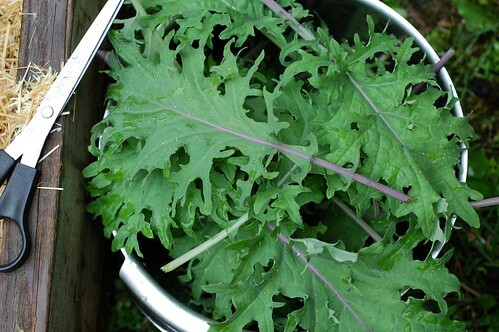 You wash and dry the kale, remove the ribs, and chop it up, then massage the lemon juice, coconut oil and salt into it. It will look more or less like this. Let it sit while you prep the rest of dinner to give the acid in the lemon juice time to soften the kale up a bit. When you’re getting close to being ready to put the meal on the table, peel and slice your avocado. Mash half of it with a fork and mix in the garlic and leave the other half in slices or cubes (or mash all of it, I’ve done it both ways). Toss the whole mess into the kale and stir well to combine then sprinkle with shredded coconut, toasted pepitas and/or toasted sesame seeds for a little nutty crunch. Remove the ribs from the kale and chop it well. 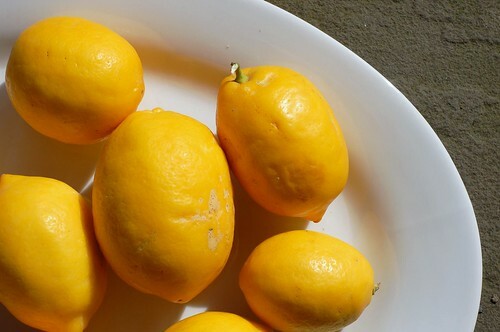 Place it in a good sized serving bowl and rub the lemon juice, sea salt and coconut oil thoroughly into the leaves. Leave it to sit for at least 10 minutes. Peel and pit the avocado and cut it into cubes. 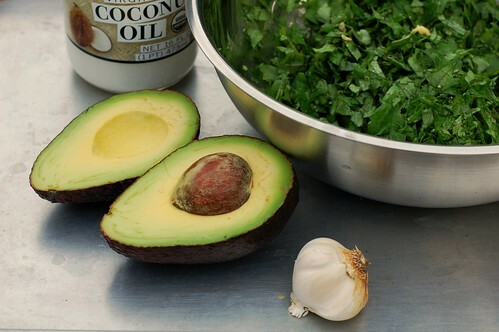 Mash half of the avocado cubes with the garlic, black pepper and maple syrup and work it into the chopped kale. Top with the rest of the cubed avocado, the shredded coconut and the toasted seeds and serve. For more delicious recipes, drool-worthy photos, giveaways, and food-related inspiration “Like” the Garden of Eating on Facebook, or follow me on Twitter or Pinterest.